Pull-ups are done by lifting your body up to a bar and lowering yourself back down. This bodyweight exercise is used in military training protocols and they are not one of the simplest exercises to perform. Along with the intense nature of this exercise, comes a number of benefits. As with anything else, the greater the effort, the greater the reward. When you want to build upper body strength, you need to create resistance with the aid of dumbbells, barbells or weight machines. Pull-ups can be done with nothing more than a pull-up bar. If you do not have access to one, you can also use an open beam, the edge of a deck or you can visit a local park and use a set of monkey bars. This makes it possible to build strength with limited equipment. Multijoint, or compound exercises, require you to use more than one muscle group and more than one joint when you perform them. These types of exercises recruit a maximal amount of muscle fibers and they can help you gain mass efficiently. Pull-ups are one of these exercises and they recruit the latissimus dorsi, rhomboids, trapezius, deltoids, pectoralis, brachialis and triceps. These are anatomical names for the back, shoulders, chest and arms. A standard pull-up is done with your palms shoulder-width apart in an overhand grip on the bar. You can also do many variations quickly and easily by changing your hand position. Chin-ups are done with an underhand grip and they put more emphasis on your biceps. Wide-grip, close-grip and alternating grip are all other hand positions you can use. In essence, you can do multiple targeted exercises without having to adjust weights. Pull-ups can help develop powerful forearms and grip strength to help improve your performance in several sports. Activities like martial arts and wrestling require a strong grip. 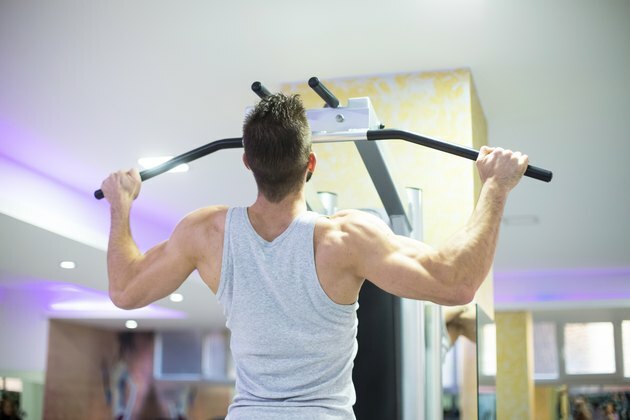 Building strength with pull-ups can transfer over to weight training exercises including pulldowns, rows and curls. Regular execution of pull-ups helps you do these exercises more easily. Why Are Pull-Ups Hard to Do?